Mont-Saint-Michel is a tiny tidal island on the coast of Normandy, very close to Brittany, at the mouth of the Couesnon River near Avranches. The Black Madonna is in the Western crypt also called chapel of Our Lady of the Underworld, late 19th century, plaster statue recalls ancient Black Madonna that was destroyed during the Revolution. 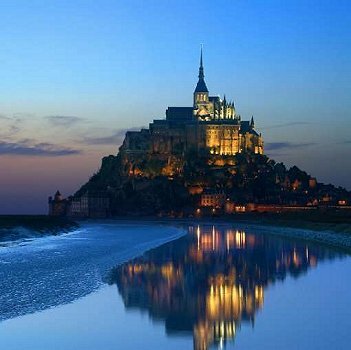 The original lady of Mont-Saint-Michel was a classic example of a Queen of the Underworld. Until the 8th century her island was called Mont-Tombe, i.e. Mount Tomb because it was a Gallic burial site. According to Ean Begg the Black Madonna that was destroyed during the Revolution wasn’t brought to the Mount until 867, when a certain Bernard le Sage brought her from the Holy Land. (*2) Before that apparently another statue of Mary was venerated in the cave as Our Lady of the Underworld. 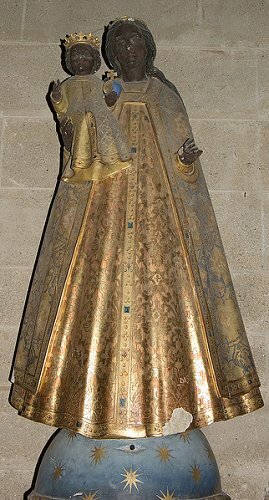 It seems that she had to make room for the more important statue from the Holy Land, was moved to another chapel and became known as Our Lady of the Thirty Candles (Notre-Dame-des-Trente-Cierges). In 966, the sanctuary was given to the Benedictines who turned St. Aubert’s oratory into a church, still called Notre-Dame-Sous-Terre. This is the oldest extant building on the mount and it dominated the island until the 11th century. Then a great Romanesque abbey church was built on top of it, turning it into a crypt. (*3) This church was in turn replaced by the even greater gothic church of the 13th century that remains today. With all this construction, the original church of Our Lady of the Underworld was covered up and forgotten. With the French Revolution the abbey was turned into a notorious prison and wasn’t reclaimed for more noble purposes until about 70 years later, in 1863. Then excavations unearthed this oldest building on the mount and an attempt was made to restore religious life and the cult of Our Lady of the Underworld. The chapel (also known as the Western crypt and the place where St. Aubert found his final resting place) was rededicated to her. However, it proved difficult to reestablish a spiritual life on this mount. For too many centuries, even long before the Revolution, its abbey had been entangled in the politics and wars of the area. The various communities of monks who inhabited the place often had a hard time focusing on spiritual matters. And so it wasn’t until 1966 that a few monks returned to the mount. The present monastic community didn’t settle in until 2001 and it seems that it took them a while to figure out what to do with the 19th century plaster Black Madonna. For a long time she was deemed as "of no artistic value",(*4) an embarrassment that was more or less hidden in different parts of the abbey. Perhaps because of our renewed interest in Black Madonnas the monks now deem her something better than no Black Madonna at all. It seems that she was recently moved from a little side room to the Chapel of Our Lady of the Underworld in the Western crypt in order to keep the memory of the ancient Mother of the Dead alive. Open daily, May to September - 09:30 to 19:00; October to April - 09:30 to 18:00, daily mass at 12:15.